A limited amount of stress can be energizing, stimulate creative responses and improve focus. Chronic ongoing stress, on the other hand, is literally toxic. It can weaken the immune system and cause high blood pressure, fatigue, depression, anxiety and even heart disease. Over time it leads to degradation of the hippocampus – the part of the brain most active in memory. Students whose behaviour is challenging are often struggling with adversity. These young people at risk need adults in their lives who are able to maintain the relational quality that builds resilience.2 Educators are usually caring individuals, keen to make such a difference, but when they are over-stretched their responses may become self-protective, with little understanding or empathy. School life for vulnerable pupils then becomes a mirror of what is happening for them elsewhere, undermining both learning and mental health. Teaching can be a stressful occupation but also a meaningful, stimulating and rewarding one. In aiming for the latter, we need to either reduce demands or increase resources. Rather than devote precious energy to things we cannot change, such as student backgrounds or government directives, let’s be creative about what is possible. So what does it mean to be doing well and what can schools put in place to make sure this happens? Whole school well-being is not a set of programs, but “how things happen around here.” A culture with high levels of social capital and creativity benefits everyone. So, rather than just remind teachers to look after themselves, here we explore whole-school values, priorities and innovations that put well-being centre stage. Most teachers say there isn’t enough time to do everything. For teachers under stress, the first thing to go may be behaviours that maintain good health such as sufficient sleep, regular exercise and healthy eating. Schools can help teachers stay well by ensuring that expectations are manageable and by thinking outside the box to create opportunities within the school day. 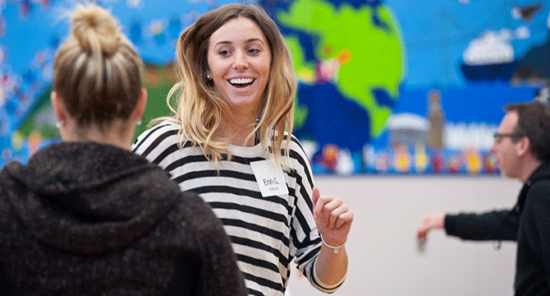 Both teachers and students need to keep active – brains slow down when the body stops moving! Having students get out of their seats and move around during lessons makes sense, but how about taking this one step further? Many teachers see lunchtime as an opportunity to finalize lesson planning, mark work or have meetings. But perhaps once or twice a week it could be a space for doing something physical alongside students? Not just traditional sports but aikido, dance, Zumba, kick-boxing or tai chi. Sharing the learning, making mistakes and laughing together also increases connectedness and stimulates positive relationships. Overworked teachers can be up half the night planning lessons, marking and doing admin. When this happens routinely rather than occasionally, it impacts on all aspects of psycho-social functioning. No one can do everything to the best of their ability all the time and stay sane, especially when they are exhausted. Something has to give. Working “smarter” rather than harder requires school management to be clear about priorities, what constitutes “good enough” and how best to share resources so individuals do not spend time re-inventing the wheel. Encouraging staff to set limits on after-hours emailing can be helpful and school leaders who model good practice give staff permission to also switch off. Another time-saving strategy is to tighten up on meetings. What is a meeting for, who actually needs to be there, is there a more time-efficient way of getting things done? Most teachers are highly conscientious. They often go to work when unwell and then take much longer to recover. A whole-school agreement about when to call in sick and stay at home can be valuable. One principal actively promoted positivity across his school and his budget for sick cover was always underspent, leaving more funds for other things. He was convinced that his staff stayed well because they were working in a happy school. The evidence suggests he was probably right. Michie and Cockcroft3 found that more serious dangers to health from toxic stress were moderated by strong social networks and support. How we relate to each other matters a great deal. There are schools operating a buddy system, not just for new teachers but for everyone. A large special school in Victoria (Australia) has “secret angels.” Everyone who wants to participate puts their name in a hat and takes another out. They are that person’s secret angel for the term. They keep an eye on their colleague, make the occasional cup of tea, perhaps take a duty for them or organize a small birthday celebration. Positive emotions underpin creativity, problem-solving and cooperation.7 These include feeling comfortable, safe, interested, joyful, excited, valued, engaged, thankful and loved. By contrast, feelings of fear, anxiety or anger shut down learning and impair relationships, so what can schools do to promote positivity? Simple recognition goes a long way. In a conference on teacher well-being in Darwin, some educators talked about going over and above for their students, often to the detriment of time spent with their own family. Yet it was only when they stopped working so hard that school leaders noticed and then commented negatively. The teachers’ frustration, despair and fury were palpable. There is no need for fulsome praise, but when efforts are noticed and openly valued this feels good, strengthens motivation and increases well-being. A card or note saying “thank you for…” or “I noticed that… ” takes little time but reaps great benefits, fitting with three of the five ways to well-being8 (Connect, Notice and Give; the others are Stay Active and Keep Learning) that the National Economics Foundation have developed. In a primary school just outside Sydney, the front page of the weekly newsletter is a thank you – not just for orchestrating major events but for everyday good work. The recipient could be an admin person, support staff or school custodian as well as educators. Teachers told me it was the first thing they looked for every Friday – who had been recognized that week. Feelings of trust and safety develop when people speak positively about each other, share fairly, demonstrate reliability by only offering what they can deliver, and communicate openly. One primary school in New South Wales has “This is a No Put Down Zone” posters everywhere – classrooms, offices and staffroom. This has proved to be surprisingly powerful. Everyone could tell me what it meant and how it impacted on school climate. One student said, “We don’t have any bullying here because of this no put down thing!” It made overt what is often hidden and brought good practice to the foreground. A positive school environment is not a Pollyanna place where there is a denial of real-life struggles. Grief, depression and anxiety can be overwhelming at times. Where there is high social capital, teachers are able to have supportive conversations with each other. They will also be better able to respond effectively to students in crisis. Conversations create culture and culture determines how people think and feel about things. Teacher perspectives on their job, the students and their families are influenced at least to some extent by how people talk about these things in the staffroom. Culture is best addressed as part of a wider well-being framework for the whole school. A first step is to identify a vision for the school, how far this had already been realized and agree on next steps. Although it is invariably the school executive that initiates whole-school well-being, it needs to be owned by all stakeholders. Once everyone has the bigger picture in mind it is easier to keep the small stuff in perspective. Focusing on what is going well and how to get more of it also raises appreciation of how much there is to be thankful for. One large independent school in Sydney introduced a “random acts of kindness” board in the staffroom where staff placed post-it notes thanking colleagues for small acts of support. This got people talking – and initiated a different staffroom conversation! Dan Pink summarises the three things that motivate people to do their best. These are autonomy, mastery and purpose. For many educators, psychological well-being is maintained by being able to teach according to their values, having some autonomy and being creative in responding to student interest and need. If they can do this they increase the personal and professional integrity that makes coming to work a joy. Educating the next generation is a meaningful occupation, but the benefits can evaporate when life gets out of balance and teachers struggle with innovation overload or having to meet endless targets. A leader who is focusing on whole-school well-being will involve staff in developing a clear direction for the school, but will trust teachers to get on with the job and not micro-manage. A last word about the importance of having fun. Oxytocin is the neurotransmitter critical in reproductive processes, but there is evidence for its involvement in connectedness, trust and cooperation throughout life. Oxytocin can be produced in the body by events taking place in the environment. One head teacher in England organizes head and shoulder massages for staff once a month on a Friday afternoon. This not only raises their oxytocin levels but makes them feel valued. Laughing together does the same thing. Where and when in your school are there opportunities to raise resilience by having fun? Teachers have a responsibility to do what they can to look after their own well-being, of course, but for every school leader wanting the best for their school, students and staff, making whole-school well-being a core priority is a no-brainer! 1 T. Noble, H. McGrath, S. Roffey, and L. Rowling, A Scoping Study on Student Well-being (Canberra, ACT: Department of Education, Employment & Workplace Relations, 2008). 2 S. Roffey, “Ordinary Magic Needs Ordinary Magicians: The power and practice of positive relationships for building youth resilience and well-being,” Kognition & Paedagogik 103 (2017): 38-57. 3 S. Michie and A. Cockcroft, “Overwork Can Kill,” British Journal of Medicine 312 (1996): 921- 922. 4 B. Johnson, “Teacher-Student Relationships that Enhance Resilience at School: A micro-level analysis of students’ views,” British Journal of Guidance and Counselling 36, No. 4 (2008): 385-398. 5 J. Hattie, Making Learning Visible: A synthesis of over 800 meta-analyses relating to achievement (London: Routledge, 2009). 7 B. Fredrickson, Positivity: Ground-breaking research to release your inner optimist and thrive (Oxford: OneWorld Publications, 2009).